Judge upholds decision, releases alleged gangster - Patrick C. Fagan, Q.C. 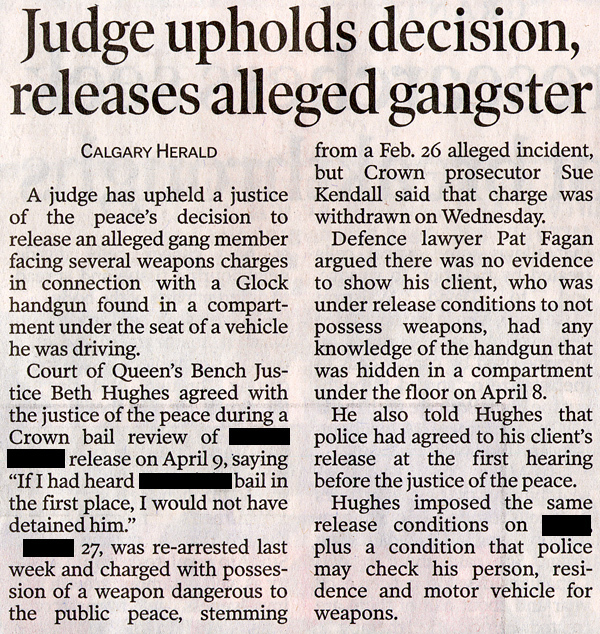 A judge has upheld a justice of the peace’s decision to release an alleged gang member facing several weapons charges in connection with a Glock handgun found in a compartment under the seat of a vehicle he was driving. The accused, 27, was re-arrested last week and charged with possession of a weapon dangerous to the public peace, stemming from a Feb. 26 alleged incident, but Crown prosecutor Sue Kendall said that charge was withdrawn on Wednesday. Defence lawyer Pat Fagan argued there was no evidence to show his client, who was under release conditions to not possess weapons, had any knowledge of the handgun that was hidden in a compartment under the floor on April 8. He also told Hughes that police had agreed to his client’s release at the first hearing before the justice of the peace. Hughes imposed the same release conditions on the accused, plus a condition that police may check his person, residence and motor vehicle for weapons.